FLOYD MAYWEATHER: "IF HE'S HAVING A PROBLEM WITH MARQUEZ...I'M THE BEST TO EVER DO IT"
"If he's having a problem with Marquez, I mean, Marquez is a good counterpuncher, but I'm the best to ever do it. We knew where Marquez was at. When Mayweather was dominating the sport, Marquez was also dominating way back when. Marquez didn't just pop up out of the blue. A majority of the great ones all went to the Olympics, American fighters and other fighters that come from other countries...All these guys had went to the Olympics and they knew these guys were something special from the beginning. I mean, it's hard for me to just know that a guy can go from a C+ fighter to an A+ fighter...other fighters have to throw 10, 20 and 30-punch combinations. I don't. I'm a sharpshooter. I know where to place the shots and, like I said, I know when to fold and when to hold," stated undefeated pound-for-pound champion Floyd Mayweather, who talked more about the outcome of Pacquiao vs. Marquez III, recent accusations made about him, and much more. Check it out! FM: (Cutting in) I don't even worry about that because he do know who I am. When they say stuff like that, my skin is tough. It goes in one ear and out the other. I don't ever worry about that. When they put me on ESPN and they talk about negative things, or when they put me on TMZ and they talk about negative things, I'm just glad that I'm relevant; to have lasted this long being relevant. Bob Arum says a lot of things that I just don't understand. 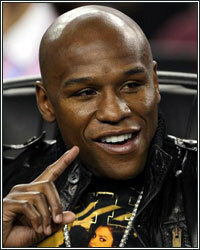 They say he [Pacquiao] is getting $22 million and then they say he's getting $6 million. I mean, what's the number? You hear certain things, negative things, all the time that aren't true, but you never hear about the positive. You never hear them talk about how Al Haymon is one of the best business guys, not just in the sport of boxing, but one of the best business guys in the world. You don't hear them talking about how we gave money to Breast Cancer research. I mean, these are things they never talk about. BT: When they actually do talk about the positive things, like paying for the funerals of Joe Frazier and Genaro Hernandez, do you think it's looked at in the wrong light because you're "Floyd Mayweather" and perceived to be a "villain"? FM: I feel it was only right to pay for Joe Frazier's funeral. That was only the right thing to do. I offered to pay the whole thing, but HBO stepped up and said they'd like to be a part of it too. Even though I put it out on Twitter, I didn't do it for no publicity. I did it because he's a legend and I think if he was in my position, he would do the same thing for me. Guys like Frazier is why I'm where I'm at. The first time that a lot of Americans ever heard about the Philippines is when Muhammad Ali and Joe Frazier went over there and fought in the Thrilla in Manilla. That's a legendary fight. A legend should be able to be buried in style. Is it okay for me to tweet one of the good things that I'm happy about doing? BT: Of course. Like I always say, it's my account, so I should be able to say what I want. I mean, that's what Twitter was created for; to allow me to communicate with the people who follow me. If you don't like what I have to say, then don't follow me. BT: Bob Arum and Freddie Roach have consistently told the media that you're scared to fight Pacquiao. This past Saturday, we saw Pacquiao struggle with Marquez, who you dominated. Immediately after the fight, they were quick to remind everyone that the counter-punching style of Marquez is difficult for Pacquiao to deal with. Now, even though they won the fight, it looks like they're going after Marquez for a 4th time. Does that saying anything to you about what they think Pacquiao's chances are should he ever face a style like yours? FM: I'm just saying that, you know, if he's having a problem with Marquez, I mean, Marquez is a good counterpuncher, but I'm the best to ever do it. We knew where Marquez was at. When Mayweather was dominating the sport, Marquez was also dominating way back when. Marquez didn't just pop up out of the blue. A majority of the great ones all went to the Olympics, American fighters and other fighters that come from other countries, like Kostya Tszyu. You know, Kostya Tszyu had that amateur background and went to the Olympics. Floyd Mayweather, De La Hoya, Pernell Whitaker, Muhammad Ali, Joe Frazier, Goerge Foreman, Holyfield, Roy Jones, Sugar Ray Leonard, and the list goes on and on. All these guys had went to the Olympics and they knew these guys were something special from the beginning. I mean, it's hard for me to just know that a guy can go from a C+ fighter to an A+ fighter. It's hard for me to believe, you know? BT: You mentioned that Marquez was dominating way back when. He turned pro back in '93, I believe, and fought most of his career as a featherweight. It wasn't really until 2007/2008 when he started moving up in weight to super feather/lightweight. Now he's a welterweight. You've been fighting at jr. welter/welterweight since about 2004. Did you ever think that you'd see a guy like Marquez competing in the same division as you? FM: Even though I started off at 130 as a professional, I eventually moved to welterweight. My father was a welterweight, so, you know, the apple don't fall far from the tree. I'm supposed to be a welterweight because that's the weight my dad fought at. Like I said before, I don't have anything to hide. Test me now! I don't have nothing to hide. When people say "this person said this about you Floyd" or "this person said that about you", the only thing I say is that I'm glad that they know who I am. They took their time out to comment, or speak, or tweet, or text, or email; whatever it took for them to comment about me, I feel good because I got some of their time and they know who I am. They're keeping me relevant. Even when I was away from the sport, my name was still coming up on the regular. Like I said before, I'm pleased with where I'm at as of today. BT: Yeah, they're definitely keeping you relevant, particularly HBO, who did a wonderful job of making it sound as if Pacquiao's subpar showing against Marquez might "convince" you to get in the ring with him, as if you were the one holding up the fight. FM: From what I heard, they said the commentators was real biased Saturday night. I mean, we got commentators that don't like me because I'm telling the truth, like what happened with the Larry Merchant situation. All I really wanted to do was thank the fans who flew out or drove out to see me fight, that have supported me over the years. I wanted to thank the fans that tuned in and bought the pay-per-view. That's the only thing I wanted to do was give the fans thanks and tell them thank you, but he was cutting me off. And I'm not saying Jim Lampley don't have a good voice or he don't commentate good, but he don't have no experience at boxing, so he really don't know what's going on. How can somebody specialize and talk about something that they never did before? BT: Well that's what I thought Manny Steward was there for, but even he seems like he's becoming more and more of a company man. I'd expect him to be the voice of reason when it comes to what's going on inside the ring, but sometimes, a lot of times lately, he says some crazy stuff. Sometimes it's like he's simply auditioning for a training gig with whoever is fighting that night (laughing). FM: You gotta realize that Emanuel Steward is an Uncle Tom. If you notice, Emanuel Steward always says Floyd Mayweather don't throw combinations like this fighter or that fight. He'll say what's-his-name throws 4, 5, 6-shot combinations. Well that shows you how good I am. I don't have to do all that and I still can get the job done, so that tells you what level I'm on. You know, other fighters have to throw 10, 20 and 30-punch combinations. I don't. I'm a sharpshooter. I know where to place the shots and, like I said, I know when to fold and when to hold.